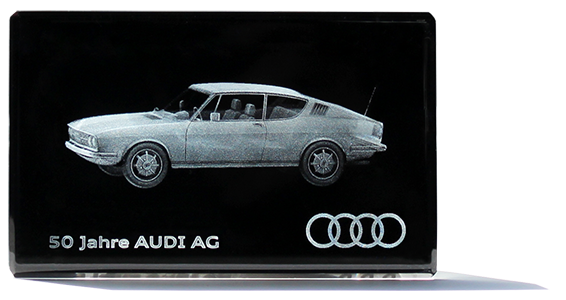 Special design for AUDI AG for special service anniversaries. Each Premium BBCrystal is marked with the respective name of the jubilee or an individual dedication. 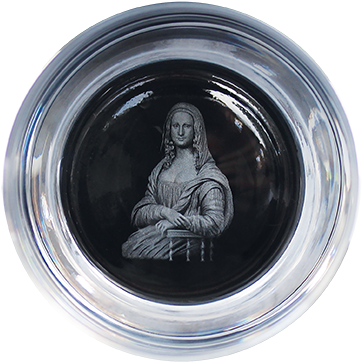 The drinking glass MONA LISA is an example of our drinking glasses with a 3D-light (low depth of the z-axis) engraving inside the bottom of the glass. Of course 2D engravings, e.g. logos, are also possible. Special design of the concept bike for BMW Motorrad Schweiz as a dealer present at events 2017/2018. The Vision Next 100 was lasered into our large premium BBCrystal 140x80x80 mm. 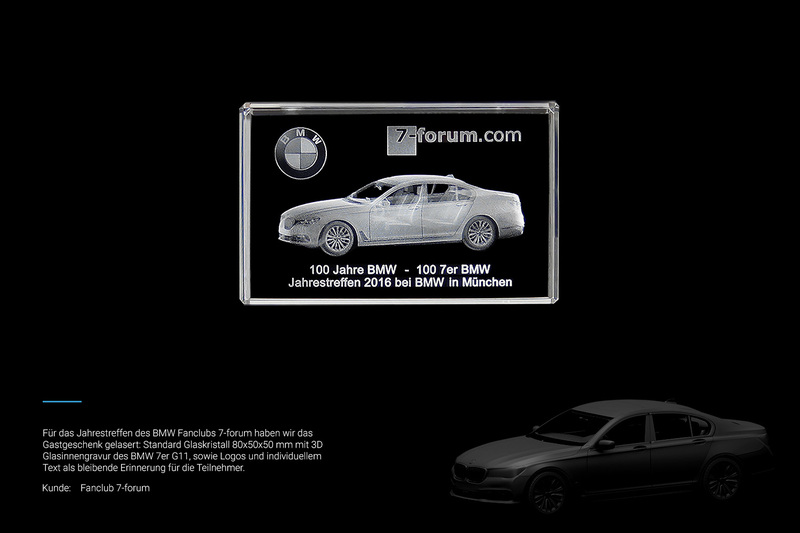 Example of a glass coin with 2D glass engraving from the BMW Collector's Edition. 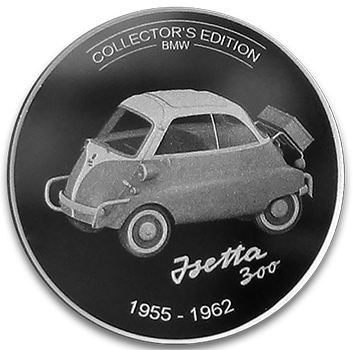 Every coin comes with an inlay with key facts of the motif, both are packed in a transparent coin pocket. 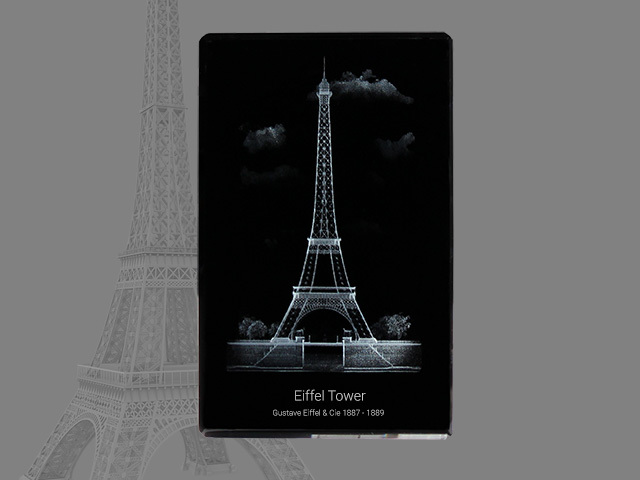 Our offering of custom fabricated 3D glass engraving is intended mainly for B2B customers. We are the partner of choice for companies, craftspersons and retailers seeking outstanding, visually appealing engraving products of high quality in larger quantities. End consumers may purchase products from the collections through online shops that carry our goods. We offer custom fabrication for end consumers in exceptional cases. Please contact us in this regard with no commitment. We are happy to find the most favourable option for you depending on the desired motif and circumstances. 2D glass engraving based on photos or pictures is gladly offered as individually fabricated items for B2B customers and end consumers. Glass engraving: We fabricate 2D and 3D interior glass engravings (no surface engraving). 2D engravings are produced based on image data, and company logos are usually 2D engravings as well. 3D glass engraving is the crowning discipline and our speciality. Producing the 3D point clouds for free-standing objects such as vehicles, instruments, sculptures or similar requires 3D data. 3D scenes such as those depicted in our Architecture collection are special cases and the required data basis is highly dependent on the motif. 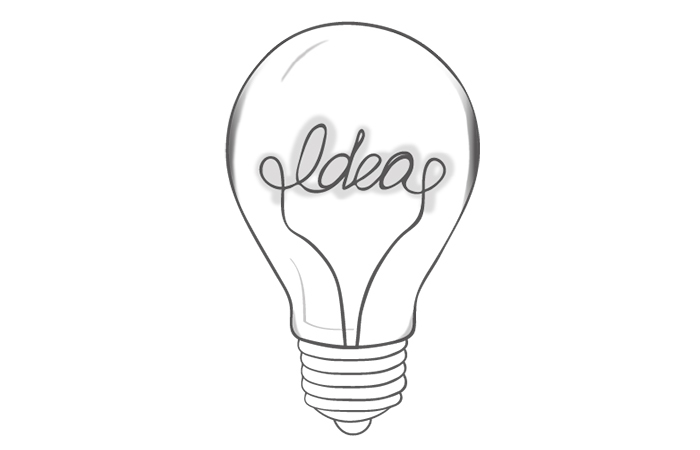 We are happy to discuss your ideas without commitment. 3D data: The 3D data for the lasering object are generally provided by you since this considerably reduces the costs. If this is not possible, we will gladly attempt to procure the 3D data directly or to model the motifs ourselves, provided we currently have the capacities available. Image editing: For 2D engravings, we convert the images provided by you to laser data the way they are delivered by you (e.g. a person is lasered with the image background). We can provide image editing services such as background removal or retouching on request. Outer packaging: Our glass blocks and keychain pendants are delivered in sturdy standard gift boxes. In case of custom fabrication in large quantities, we are happy to advise you regarding individual, decorative outer packaging or to handle procurement. Designing the point cloud using our phenolux method makes a high quality 3D glass engraving into glass of outstanding visual appeal possible, representing each 3D model down to the details and in finely balanced shades of grey. We invest about 5-7 working days in this depending on the motif, which naturally incurs corresponding design costs. The standard method to prepare a point cloud is less elaborate and therefore incurs lower one-time costs. This method is also more suitable for some motifs, for example in case of technical machinery or vehicle engines that have a low-contrast surface and where the 3D model simultaneously consists of countless small individual objects. When you submit your 3D data, we check with no commitment which method is suitable for preparing the point cloud (laser file). The special BBCrystal laser glass brings out any lasered motif to its best advantage. 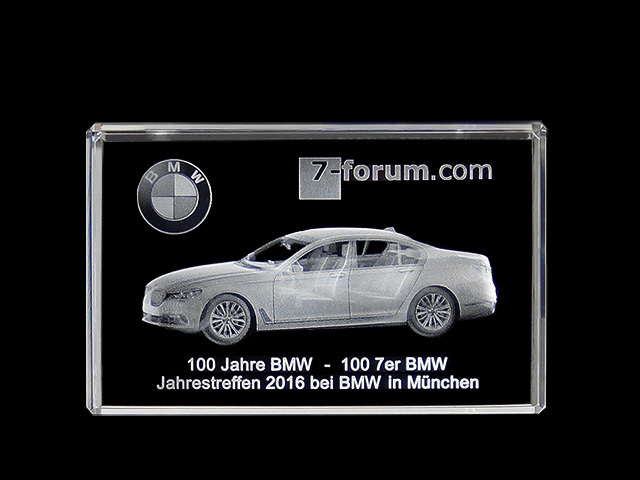 The patented crystal glass is available in two sizes (80x50x50mm and 140x80x80mm, landscape or portrait format), and always the right choice for 3D crystal engraving products in the premium market segment or for special occasions. Naturally we also laser standard glass (transparent) in various sizes and formats. Keychain pendants, drinking glasses and collectible coins fall into this category. Please talk to us if you have special wishes regarding the glass shape and size. The package offers apply to the 3D design of the point cloud using the phenolux method. Since preparing the point cloud according to the phenolux method takes about 5-7 working days, corresponding design costs are incurred. We are happy to accommodate you with the Comfort und Premium design packages when your desired motif for the 80x50x50mm BBCrystal would complement our existing or future collections. 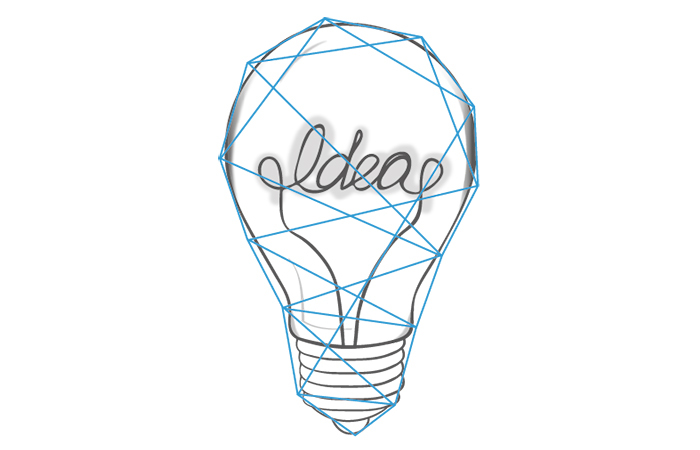 Depending on the package, we only charge a proportion of the design costs with a corresponding minimum purchase quantity and reserve the right to use the point clouds for our purposes as well. You obtain exclusive use of the point cloud with the Basic package. The full design costs are paid by you, and you are free to decide what quantities are fabricated for your exclusive use. 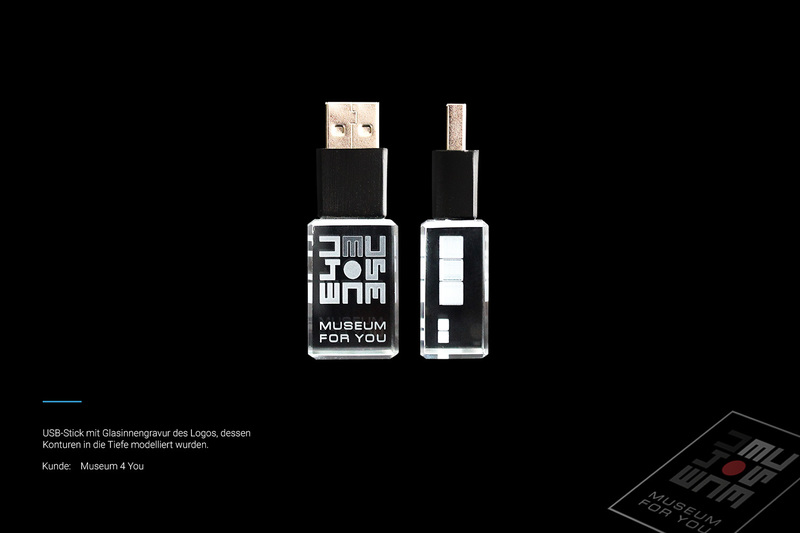 This is of interest for example in case of limited editions or very specialised motifs. The grey scale: the more shades of grey, nuances and surfaces there are in the model, the better the motif can be realised as a point cloud. The format: rectangular motifs tend to be especially well suited for our premium glass since they can be optimally positioned in the glass, either in the portrait or the landscape format. While square motif contours do not optimise the use of space, they can be implemented as well. Desired glass size: BBCrystal 80x50x50 mm or 140x80x80 mm. For standard glass there are other sizes available too. Once a 3D file is on hand, the expected processing and production time can be stated (depending on the volume). This is usually where our design process begins. The desired glass format should be established by this point as well, since a separate scatter plot has to be created for each glass size. The motif is implemented as a point cloud based on the 3D file in approximately 7-10 working days. This point cloud is the laser file (production file). Production can begin after sampling and approval. Any number of units can be produced once the laser file has been created. The file does not wear out, unlike for instance a tool. This means the design costs are amortised more quickly the more is produced. In the final process step, the desired motif is lasered as a 3D interior glass engraving. It is presented to best advantage with our premium BBCrystal. We work with precision lasers of high quality that optimally implement the fine nuances and details of our point cloud. The result is impressive. Every glass is subject to a final quality control and is delivered in a sturdy gift box. For large quantities, we would be happy to consider individual packaging. Please contact us in this regard. What do I need to provide for a 3D interior glass engraving? 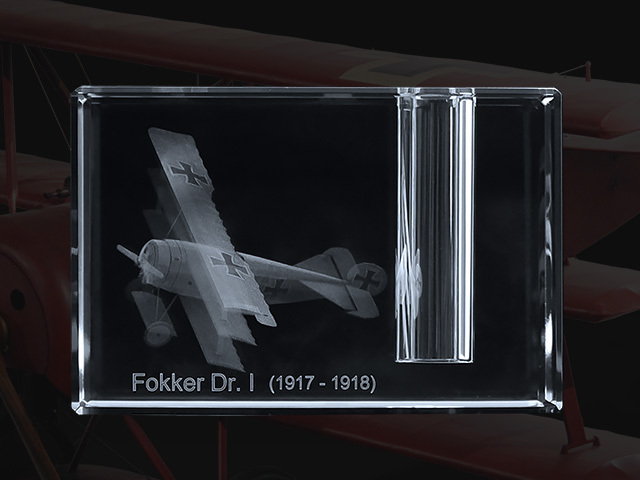 We need a 3D file of the motif to be lasered in glass as a 3D object. 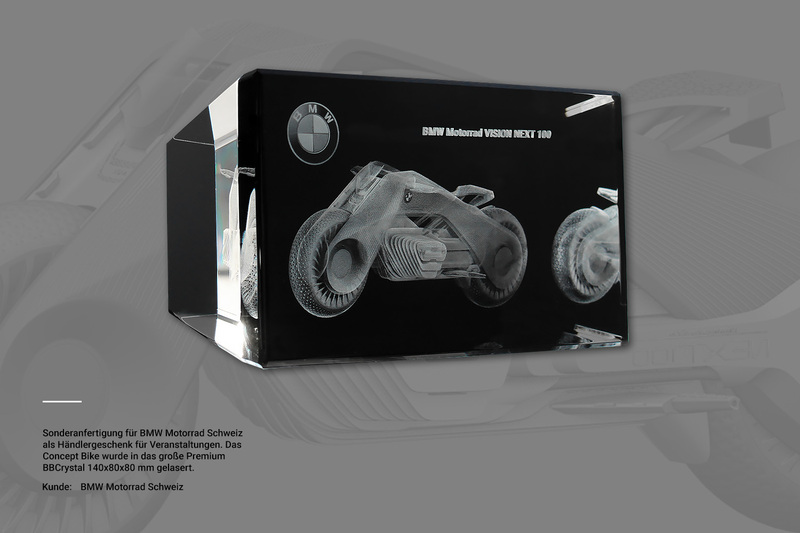 Delivering this 3D file considerably reduces the design costs. Naturally we treat all supplied 3D data as strictly confidential and use them exclusively for the purposes designated by you. What 3D data formats can be processed? We prefer the OBJ format but can also process the 3DS, STL, DXF, IGS and other formats. Please contact us if your format is not listed here. What is required for a 2D glass engraving? 2D laser engravings are produced from photos, graphics, signatures or logos. 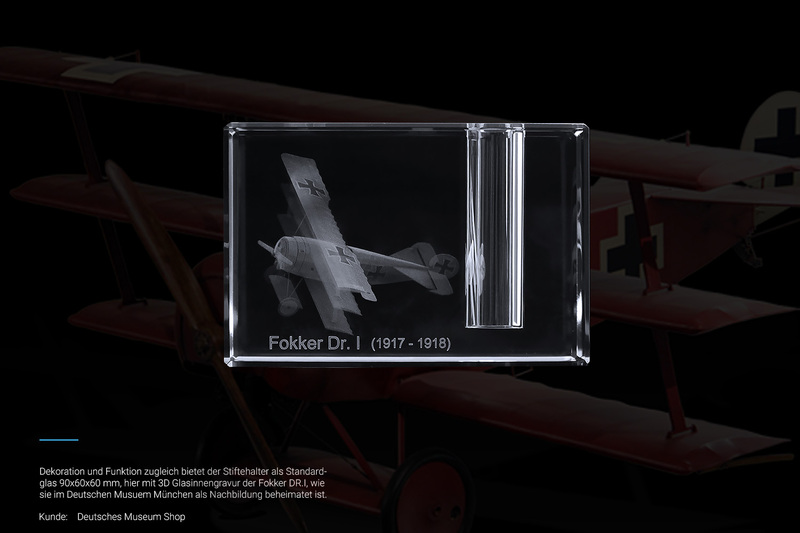 Photos are lasered 1:1 in glass and should be supplied with a high resolution in the jpg, tif or png format. If you only want the main motif to be lasered without the existing background, image editing costs are incurred based on the time spent. For graphics and signatures, what you want to be visible in the glass should be light coloured to white. Black elements do not produce any laser points. Ideally you therefore send us white contours or grey scale areas on a 100% black background or an outline in the png format. Simple line graphics such as signatures can also be converted by us. 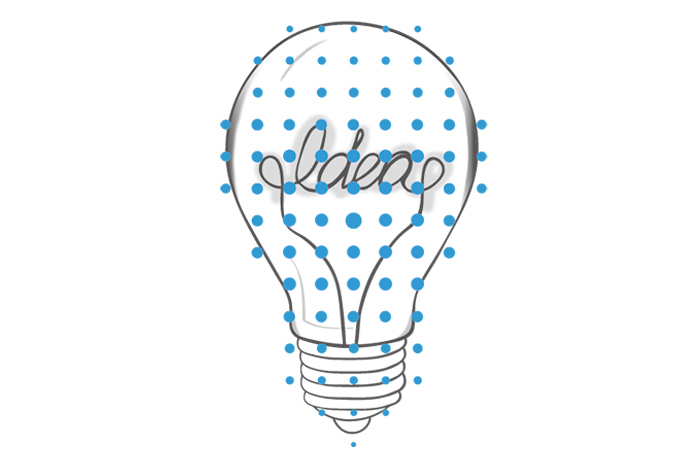 We generally require logos as outlines in the png or eps file format. 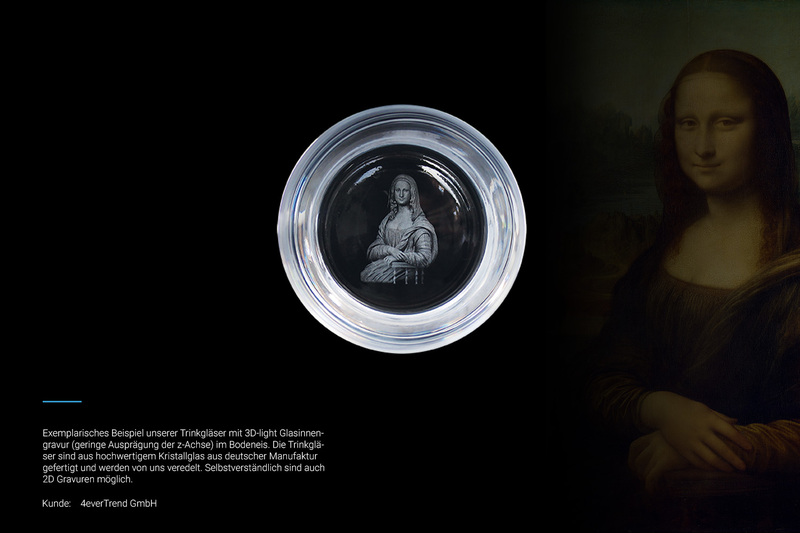 Can a 3D glass engraving be produced from a photo? 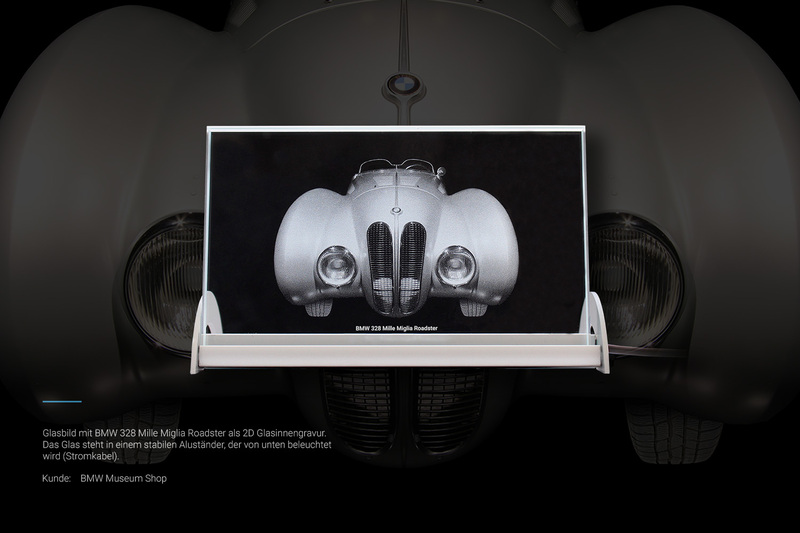 Unfortunately it is not possible to produce a 3D laser engraving directly from a photo of an object such as a car. We need the object as an existing 3D file for this purpose. What generally needs to be considered for a glass engraving? The following principle applies for laser engraving: white or light-coloured areas and surfaces in the image, logo or 3D file generate a large number of laser points in a dense grid, while dark or black areas generate few to none. Consequently, motifs with good contrast and many shades of grey produce a corresponding beautiful lasering result. That is why we invest so much time in the details with 3D laser engraving using our phenolux method. What glass formats and glass sizes do you offer? Our special BBCrystal laser glass with black glass backing is available in two different sizes: 80x50x50 mm and 140x80x80 mm. Our core standard glass range (transparent) includes 80x50x50 mm, 90x60x60 mm and 140x80x80 mm glass crystals, 30x20x15 mm keychain pendants, collectible coins and drinking glasses. Naturally we also laser other formats and sizes up to the maximum engraving range of 30x30x15 cm. 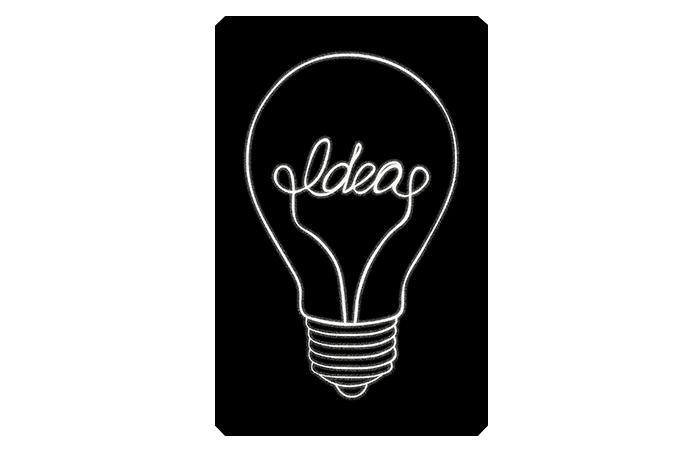 Talk to us and tell us about your ideas. We will gladly attempt to meet your needs. Which of your products can be refined with a glass engraving? 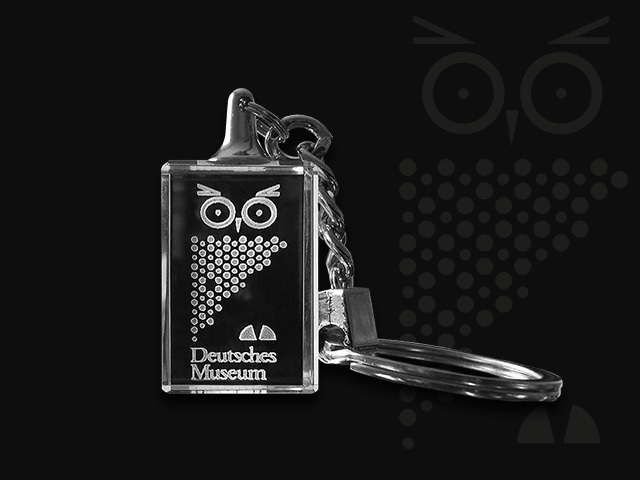 We laser the previously mentioned glass blocks, keychain pendants, collectible coins and drinking glasses. We also offer flat glass (glass pictures) for 2D engraving in two sizes: 150x90x10 mm and 225x165x10 mm. Both sizes are delivered with an illuminated base, a support for the glass picture that is lit from below. We also refine glass USB sticks with laser engravings. Please contact us if you are interested. What possibilities are there if I do not have any 3D data? If you do not have a 3D file, we are happy to look for alternative possibilities to obtain suitable 3D data. Depending on the motif and complexity, we are able to buy from stock portals, have the modelling done by external providers or do the modelling ourselves if we currently have the capacities. Here we show you some examples of the glass engravings we have made for our customers. 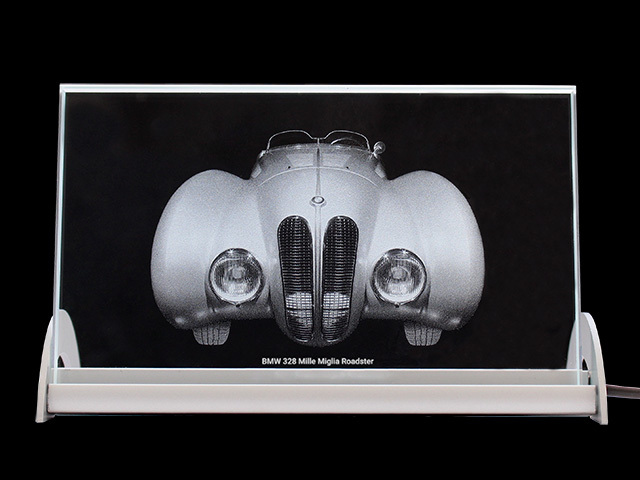 3D interior glass engravings offer many possible uses: as a sales item for your own museum or design shop, as a customer gift or give-away for participants of an event, as trophies for winners, as recognition for company anniversaries or farewell gifts. 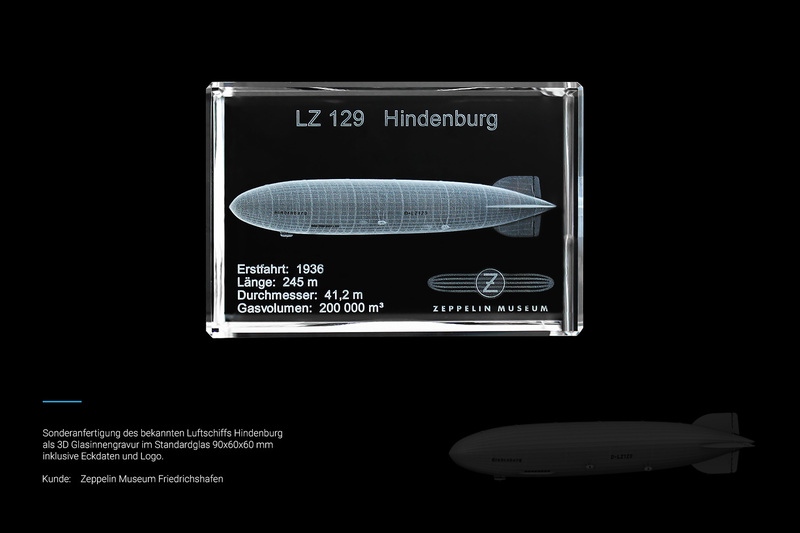 Special design for the Zeppelin Museum Friedrichshafen in standard glass 90x60x60mm. 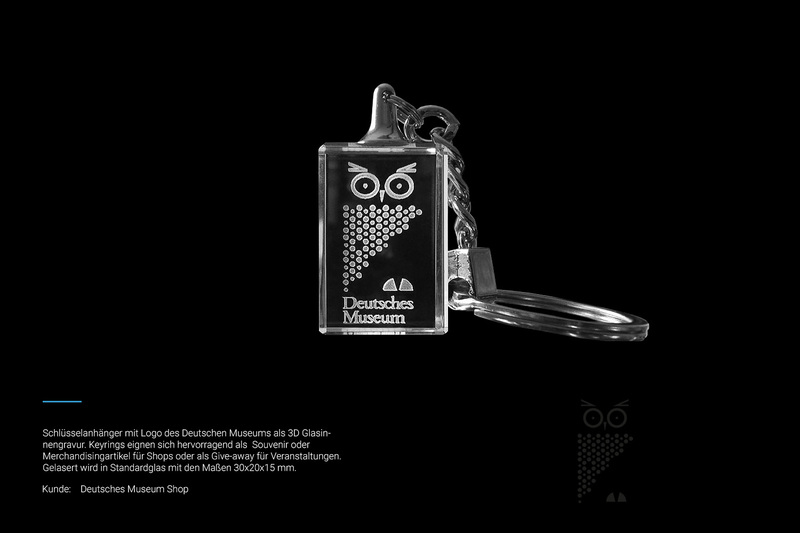 Keyring for Deutsches Museum Shop. Glass dimension 30x20x15 mm. 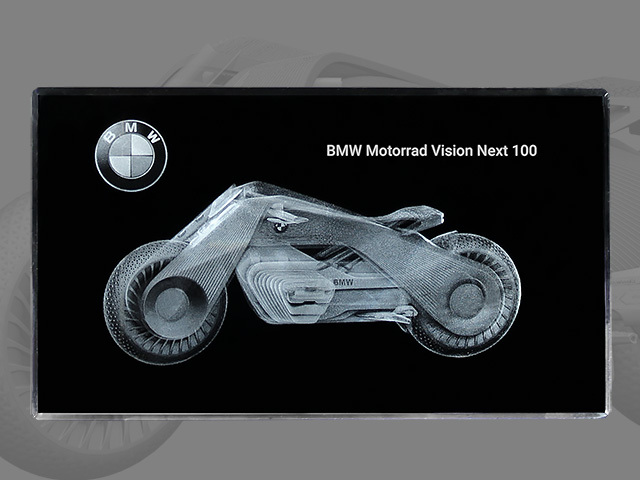 BMW Concept Bike as 3D glass engraving within in the big BBCrystal 140x80x80 mm. 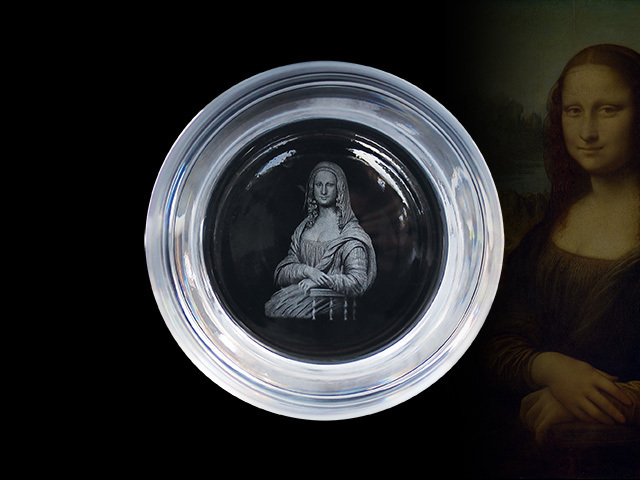 Mona Lisa as 3D-light glass engraving into glass bottom. 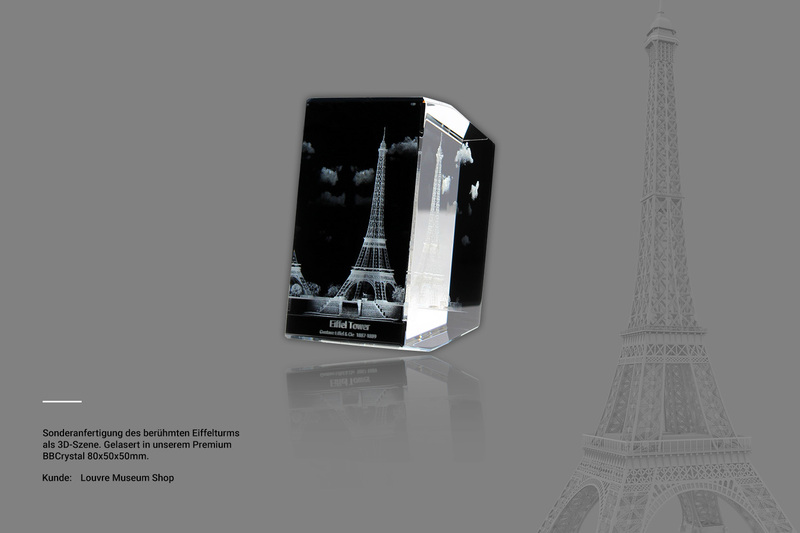 3D-scene with Eiffel Tower as glass engraving in BBCrystal 80x50x50 mm. Picture engraved into flat glass 150x90x10 mm including lighting base. Gift for the participants of the 7-forum Annual Meeting 2016. 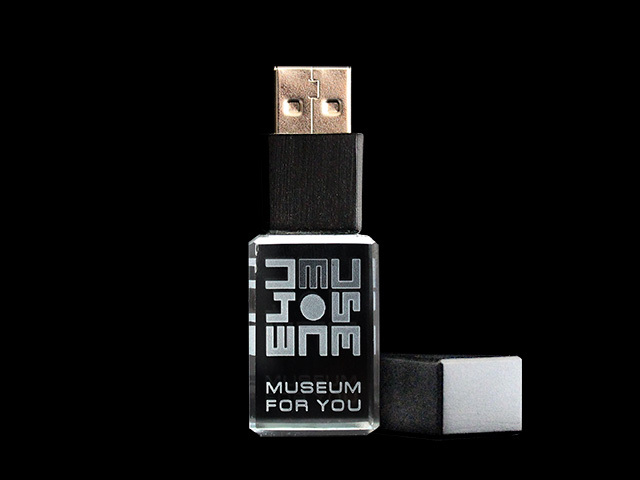 USB-Stick with laser engraved logo mark. 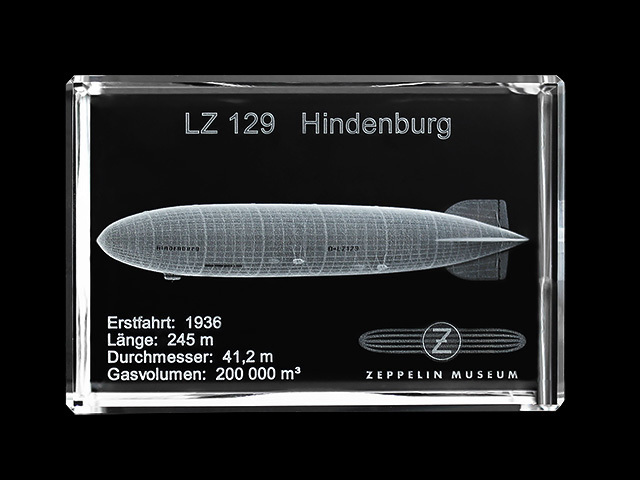 3D laser engraving in standard glass with pen holding function in the dimensions 90x60x60 mm.